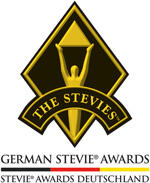 The newest Stevie Awards program, the German Stevie Awards, is now accepting nominations from all organizations operating in Germany at www.StevieAwards.com/Deutschland. Recognizing the best in business in Germany, the program is offering the lowest entry fee of the year at 99 euros for all entries submitted by the November 5 deadline. Entry fees will rise substantially on November 6, through the final entry deadline of December 10. The German Stevie Awards opened for entries in mid-August and have received an impressive number of nominations thus far from a wide variety of organizations. The Stevie Awards are considered to be the world’s premier business awards, conferring recognition over the past 12 years in programs such as The International Business Awards and The American Business Awards. Stevie Awards programs attract more than 8,000 nominations each year from organizations in more than 60 nations. Judging for the competition will be conducted in two rounds. The first round will determine Gold, Silver and Bronze Stevie Award winners in each category. Stevie Awards competitions typically feature more than 200 executives as judges. Those winners will be announced on February 23. All of the Gold Stevie Award winners will then compete in the second round of judging for the right to be named the Grand Stevie Award winner in their category groups. Gold, Silver and Bronze Stevie winners will be honored, and Grand Stevie Award winners announced, at a gala awards banquet in Berlin in late March. The Stevie Award trophies, made by the company that makes the Oscar and other major international awards, are among the world's most coveted prizes.